What attracts people to book shops and, in particular, good book shops? It's the books – certainly – and definitely the service provided by the helpful proprietors. Maybe it's the smell! Come on, how many of you have lifted a book to your nose and indulged in the heady aroma of literature? 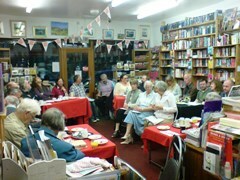 Well on Friday evening it was the promise of listening to a full programme of poetry and prose that attracted an audience of over thirty eager fans to Better Read Books on Ythan Terrace, Ellon. As part of the New Words Festival 2014, Bill and Euan Kelly of the aforementioned establishment threw open the doors of their wonderfully stocked shop to the large but very welcome audience. Never thrown off balance of course, extra chairs were found, cups of tea and glasses of wine procured and everyone soon settled down for the evening's entertainment ahead. Hosted by festival director Haworth Hodgkinson, the evening soon established itself as a classic of its type with poems that encompassed a wide range of subject matter, from a puddock (a frog) read by Frances Jaffray, to a poem by John Keats (Fred Crawford). Ian Anderson read his poignant Elrick Hill and Me and Mrs Jones, a riotous tale of a rubber band chewing (ex) work-colleague. Yvonne Heald read Wild Deer from her anthology Unrequited Love, a collection jointly written with Pamela Shand, and Paul McKeown read his excellent When Lavinia Went to Lidl and Wave. Other poems in the programme included Catriona Yule's No Distractions (read by Michael Robb) from the Guiding Lights anthology and Where I sit a new poem by Bernard Briggs. Emma O'Connor read poetry from her debut collection The Insomnia Poems (No. 1 best seller on Kindle) and Pamela Kelly read some Pam Ayres, always a sure-fire winner! There were many poems in English (sadly too many to list in this review), in Scots, and to satisfy the most demanding of tastes, even a Doric poem about leeches! Great fun! Poetry lovers didn't get things all their own way though. Introducing a nice change in the evening's dynamic, John Sawkins (in attendance also to publicise the Scottish Mental Health Arts and Film Festival) read a first rate short story entitled Taxi Driver from his book Defragmenting the Soul. 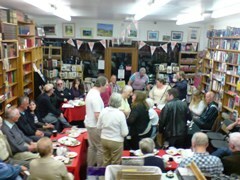 As always, at their events, Bill and Euan provided an excellent range of refreshments during the break, which was well received by the assembled crowd and as the curtain fell and folks started to drift out, chatting, into the fresh night air, it was considered to have been an excellent evening of rich and varied content. Once again Better Read Books and the New Words Festival had delivered a great night of entertainment and one that, no doubt, will be long discussed and remembered.